natalie's sentiments: The Second Trimester. Savor it. Ah, the second trimester. What a wonderful time to be pregnant. This is the time we dream of when we think of being in the family way. You look like yourself, just with a cute little tummy. You feel good. The nausea of the hellish first trimester is gone. It's not all perfect of course. I've been crazy tired this time around. Maybe its from having to pee all though the night and my sides are sore from only having one sleeping position to sleep in. (I fantasize about sleeping on my back and belly again.) Or maybe it's because I'm "advanced maternal age" at a whopping 35 years old. And I've been dealing with boughts of pregnancy induced depression. Usually it only lasts for an hour or so, but it's still very unpleasant. And I may have full on wet my pants in the middle of Hobby Lobby when I sneezed last month. Honestly, I don't remember even having to pee. But I'm trying to enjoy this time. Right now, I feel the baby wiggling gently in my belly. Instead of crashing herself against my ribs and bladder, which will be very soon. 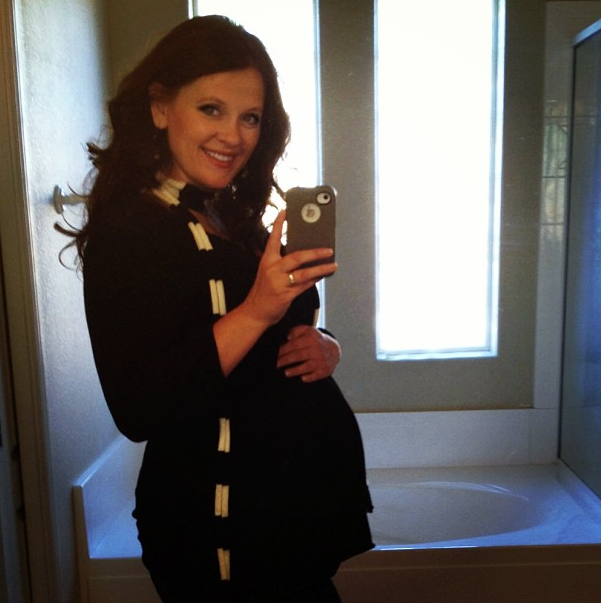 Right now my maternity clothes fit beautifully. Instead of straining to cover the enormous being I will develop into shortly. Right now eating is a wonderfully pleasant experience. Instead of making me completely full after just a few bites, then leaving me ravenous only minutes later. Right now my skin is glowing and occasionally I get flirted with before the guy spots my telling tummy. Pretty soon I will become the epitome of asexual. My pelvis will actually start to loosen and my walk with transform into a waddle. No one is flirting with that. Right now my hair is thick and lustrous, and my nails are long and manicured. Instead of the greasy unwashed hair that will be falling out shortly after the baby is born. And my brittle nails will be filled with diaper cream and poop. Right now I actually like getting it on. Instead of wanting to cry at the thought of getting naked at 8 months pregnant, or being so happy at the news I need to wait 8 weeks after the c-section before getting intimate. "Are you sure doctor? Maybe we can make it 10?" Yes. I love being pregnant. Good luck with the rest of your pregnancy! I have had two c-sections myself, no fun... and hard pregnancies! I just started my blog and would love anyone to stop by. www.happierhappenings.blogspot.com thanks! Oh this made me LOL! I passed the 2nd trimester loveliness long ago and traded it in for the 3rd trimester waddle, inability to hold much food in my tummy, unintentional peeing when I have no idea I even need to go... My hips hurt, my back hurts, everything hurts. I swear we get SO uncomfortable so we're emotionally and mentally ready when birth-day comes!!! I'm so grateful for my baby but I'm definitely getting mentally prepared!!! You look beautiful! Happy second trimester to you!! Thanks guys! You are so sweet.